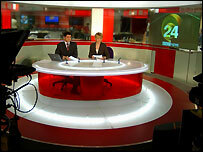 News 24 has won the award for news channel of the year at the Royal Television Society television journalism awards. The RTS panel felt that this was the year the channel had come into its own, "making enterprising and authoritative use of all the resources available to it, and providing in-depth coverage across the full breadth of stories." The BBC won five other awards at the ceremony hosted by Mary Nightingale, which took place on Wednesday night at the London Hilton. BBC One's The Real Story won the home current affairs award for its Detention Undercover programme. The judges said they were "particularly impressed by the exposure of some genuinely shocking aspects of the way this institution treated some of its inmates". The Children of Beslan - A Brook Lapping production for BBC Two - won the international current affairs award. A second Brook Lapping production for BBC Two, Israel & The Arabs - Elusive Peace, won programme of the year. Nik Millard won camera operator of the year award for his work for the Ten O'clock News and a BBC news special. He was honoured for his coverage of the Tsunami, Sri Lanka and Afghanistan. The Look North team won the nations and regions award for their coverage of the Joanne Nelson murder case. The RTS jury said that the "combination of both pace and detail made this riveting to watch."